In Russia, many great traditions in the fine arts date back to the time of the czars. 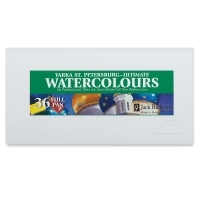 In the 21st century, Yarka St. Petersburg Watercolor Pans are still manufactured using traditional materials and techniques, and with great care and craftsmanship. The color specialists who oversee Yarka production each have over 40 years of experience. All the pigments, including cobalt and cadmium pigments, are Russian-made in a factory that has been known for its quality for over a century. 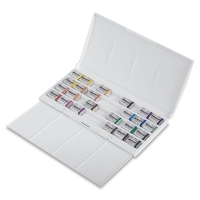 Unlike other watercolors which are made with the dry, compressed extrusion process, St. Petersburg Watercolors are liquid poured — a process preserving the integrity of each pigment and resulting in semi-moist pans that respond instantly to a wet brush. For set contents, view the Item Specs tab. High Chroma Set w/FREE Brush — Add bright pops of color to your paintings with this set of 12 vibrant colors. 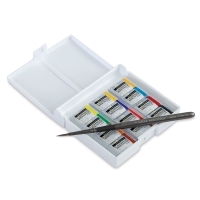 Essential Set w/FREE Brush — Build your palette with 12 essential colors. 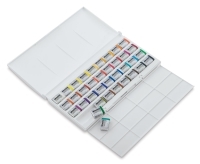 Ultimate Set — Featuring a larger assortment of colors, this set includes 36 pans of watercolor in a plastic palette. Original Set — This palette of traditional colors includes a printed color chart and 24 pans, each one rated for lightfastness. 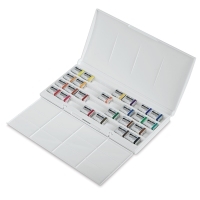 Master Set — This set offers 12 beautiful watercolors presented in an elegant slide top wood box. 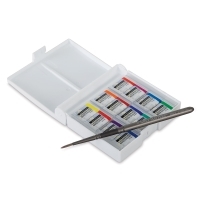 Sequel Set — This set, presented in a plastic case, contains 24 beautiful watercolors. Expanded Set — This set, presented in a plastic case, includes 24 select colors that add excitement to your color palette. 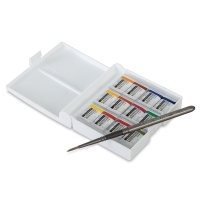 Earth Set w/FREE Brush — This soothing set of 12 is perfect for landscape scenes and plein air painting.